If you’ve ever been to the dentist, you’ve heard them talk about enamel. But to really understand how to keep your teeth healthy, you have to know what enamel is and how best to take care of it. Here is your beginners guide to understanding enamel for a healthy smile! Enamel is a protective layer that covers each and every tooth. It is a hard substance on the outer part of your teeth and is the part you see every time you look into your mouth. 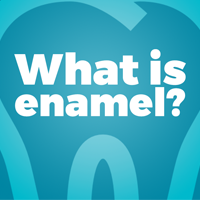 Did you know that enamel is considered the hardest substance in the human body? It’s even harder than bones. However, just like our bones, it isn’t indestructible. It can decay when exposed to acid and a build-up of bacteria in the mouth. There are many foods that can damage enamel, but sugary foods, or foods with a high citrus content are the worst offenders. Drinks high in both sugar and acid, like soda, are the number one culprits. Particularly acidic fruits (think citrus) can also harm enamel, but fear not! These foods have health benefits. Don’t cut fruit from your diet just because you’re afraid to damage your enamel. Instead, try eating them in moderation and alongside foods that are neutral so that you are not giving your teeth a double dose of acidity. It may take some time for you to notice the loss of your enamel because the changes are subtle. First, you will feel pain or sensitivity when eating certain foods. As the erosion progresses, you will notice a yellow discoloration on your teeth. Your teeth may also appear more rounded, chipped, or rough.